Architectural firms, Phillips Swager Associates & Woolen and Molzan & Partners, Inc. designed the Funk (ACES) Library. 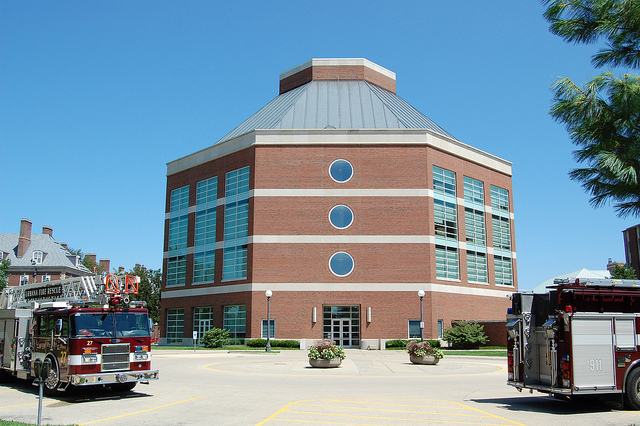 The library building was completed in 2001 and is located in Urbana. Many don't know that ACES stands for Agricultural, Consumer and Environmental Sciences, as the library is often called the Funk Library. This is due to Isaac and Cassandra Funk's generous donation that went into the construction of the library. In 1912, many university professors looked to create an agriculture library, and in 1914, the University had its first agriculture library when they got hold of several thousands of books on the subject set up in an "agriculture room." In 1924, there were too many books for the room to hold, therefore the so-called library was transferred into Mumford Hall. These books remained there for about 77 years until the ACES Library was constructed in 2001. In 1995, the department of Home Economics-the primary users of the library-became the College of Agricultural, Consumer and Environmental Sciences, which is why they named the Library the Funk ACES Library. The project of the ACES library aims to create distinguished architecture which can increase the visual unity of the scenery of the south campus. The library's design intends for the building to act as more than a library. The design of the building is intended to incorporate computer labs, conference rooms, offices for alumni connection, and an environment for hosting corporate interviews and scholarships for the ACES College. In addition, the building is meant to be a striking visual experience-a point that stands out in a long expanse of green space on campus. One of the study rooms is regarded as a gift from the class of 1941 in the College of Agriculture, which commemorates their ten classmates who died in the Second World War. 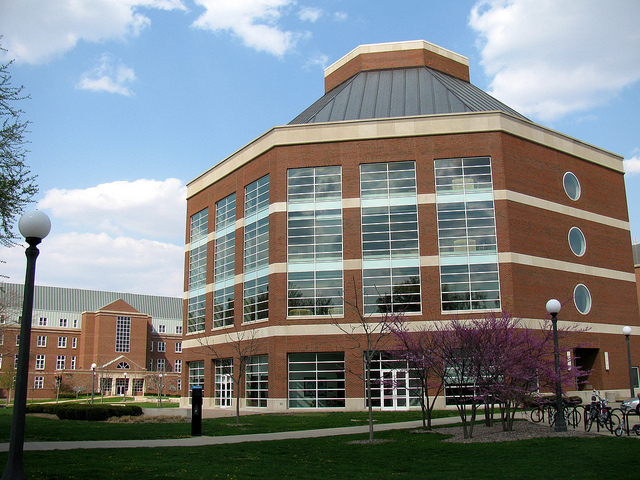 ACES Library, also known as the Funk Library, is a five-story building with a basement containing multimedia studios and instruction labs. The ground floor contains several conference rooms, offices, and a heritage room. 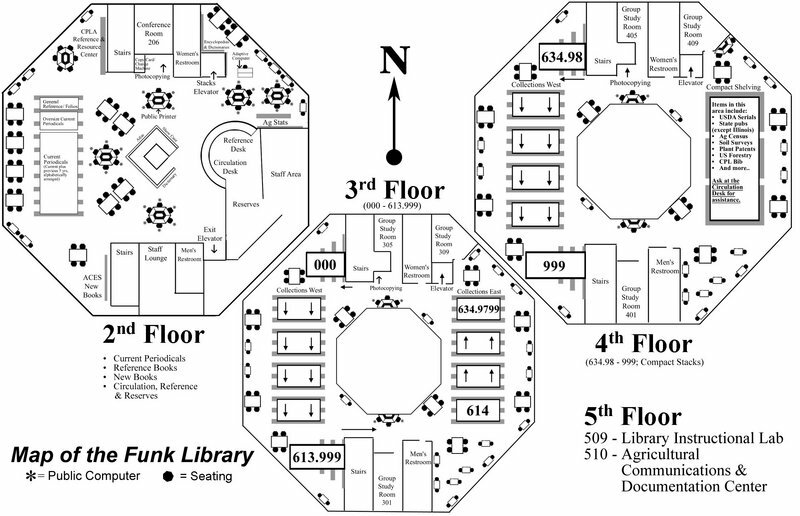 The Funk ACES Library is located from the second to fifth levels of the building. In addition to the stacks space that is included among the second to fourth levels of the building, the second level of the building contains library offices, a conference room and individual study spaces. 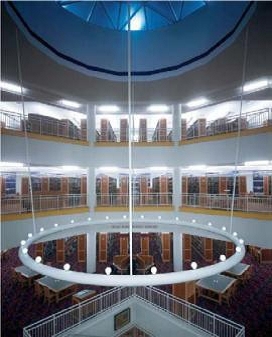 The third and fourth levels contain individual study spaces and group study rooms. Woolen, Molzan and Partners and Phillips Swager Associates collaborated to build Funk ACES Library at the University of Illinois with the funding coming from alumni. Woolen, Molzan and Partners was a fairly small firm prior to 1960, mainly designing churches, residential houses, and bank facilities. However, in 1960, Evan Woolen was hired by Butler University of Indianapolis to design Clowes Memorial Hall. It was a concert hall that featured 2,200 seats. From then on, the firm started bringing in large commissions from all around the United States. The firm began to specialize in libraries, which they continued to do until the firm's dissolution. During their existence, the firm worked for many educational institutions and public works. Woolen, Molzan and Partners was extremely well-known for designing libraries. Phillips Swager Associates, founded in the 1950's, accepted many different types of jobs from various clients. The firm has completed many projects ranging in budgets for educational institutes, prisons, and hospitals. Their principles are completing jobs on time and being involved in the project throughout the whole course in order to provide constant communication. Additionally, they construct their designs efficiently to make sure the costs are low and the project is completed on time. Christian Dillon-Duque, Hui Mo, and Jinwoo Oak, “ACES Library,” ExploreCU, accessed April 20, 2019, https://explorecu.org/items/show/275. Jewel of the Aces Campus: Aces Library Information & Alumni Center. Urbana, Ill: University of Illinois, 2001. Print. "Woollen, Molzan and Partners." Wikipedia. Wikimedia Foundation, 22 Oct. 2013. Web. 20 Nov. 2013. "Phillips Swager Associates." Phillips Swager Associates. N.p., n.d. Web. 20 Nov. 2013. "ACES Library, Information and Alumni Center," The University of Illinois Wikipedia, accessed November 19, 2013http://www.uofiwiki.org/wiki/ACES_Library,_Information_and_Alumni_Center "ACES Library, Information and Alumni Center," Ratio Architects, accessed November 17 2013http://www.ratioarchitects.com/assets/uploads/UIUC_ACES_Library_Info_and_Alumni_Center.pdf "ACES Library, Information and Alumni Center," UIhistories Project, accessed November 19, 2013http://uihistories.library.illinois.edu/cgi-bin/cview?SITEID=1&ID=4 File: ACES Library Atrium.jpg. Wikipedia, accessed November 20, 2013http://en.wikipedia.org/wiki/File:ACES_Library_Atrium.jpg Allen (Pat) S, Robert. "University of Illinois at Urbana-Champaign Dedicates New Agricultural, Consumer & Environmental Sciences Library Part I§ Food for thought 33.1 (2002): 12-13. Print.